Awesome customizable eco-friendly paper invitation. Thank you Custom Earth Promos. This is the exact product I was looking for. 100% eco-friendly is the way to go. Customizing these invites was a cool experience. I also like that they won't just be thrown in the trash, they will be planted. Using a company that is 100% eco-friendly is the way to go in this industry. Really cool idea for invitations being that they actually have the seeds embedded in the paper. Loved customizing my invitations! They were exactly what I was looking for! Anyone that received our paper invitations was genuinely impressed with the basis behind them. It promoted our company and where able to contribute to the "going green" movement thanks CEP. So many different ways to promote with these invitations great job Custom Earth Promos. Customizing these invites was a cool experience. I also like that they won't just be thrown in the trash, they will be planted. So many styles of seed paper invites on this site. Nice job. I am an event planner and have used these seed paper invites time and time again. This is a great product. Very impressive invite cards. They really are the definition of Eco-friendly from beginning to end. I highly recommend these seed paper invites for any events or conventions. A real earth conscience theme being that even the inks are bio degradable. Great customization options with this product. I made them for my girlfriends wedding and they were a huge hit. These are the only invitations I will buy from now on. Made out of seed paper and are 100% recycled paper. They really support the earth-friendly cause. I ordered these seed paper invites for all our events, when I explain that they can be planted people are wowed. We chose these seed paper invitations for the wedding. They looked very classy and had great texture to them. We liked that we could do something different in regards to invitations and these were the perfect thing. Our invites for our gathering couldn't have been cooler. We appreciated all the hard work put into our design. Thanks for everything. Send a message of sustainability without sacrificing style with the Custom Earth Promos' collection of Premium Seed Paper Invitations. Make an eco-memorable impression that continues to flourish, as attending guests will soon have a beautiful living reminder of your fantastic party, professional or personal gathering. Create a fun pre-party activity and build buzz for your event with an appropriate hashtag to promote the eco-friendly theme. If you're half of an eco-conscious couple, seed paper invitations are a perfect way to announce the theme for what will be an entirely eco-aware affair. 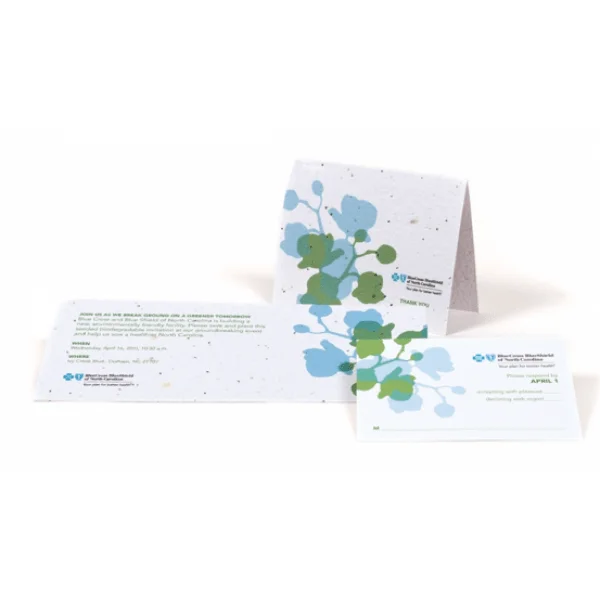 100% post-consumer recycled paper is embedded with highest germination rate wildflower seeds to make Premium Seed Paper Invitations that are entirely eco-friendly and guaranteed to grow into flourishing gardens. In a production process that ensures elimination of eco-impact and guaranteed purity of product for customer safety, seed paper invitations create a beautiful living representation of both your union and mutual devotion to the environment. Build a custom order design that includes a hashtag like #EcoEngagement to be rendered on the inside of your card. Encourage invited guests to include this hashtag when posting about preparations for your big day. Get creative and encourage interaction between guests before the event with a surprise gift for the first guest to post a pic of seed paper sprouting. With sprouting expected in just 1-2 weeks, eco-friendly invitations will soon bloom into beautiful wildflowers that can be used in bouquets and boutonnieres for your bridal party! Seed paper invitations are a great way to promote green events and invest in the eco-friendly brand image of your business. The entire invitation is ready-to-plant and guaranteed to bloom into a lasting reminder of your eco-aware initiatives. Invitations come in 5 suites, each design featuring the rich texture of our premium seed paper and created with the color palette of your choice. Our top performing seed paper can be used to create invitations, RSVP cards and thank you cards. Each invitation comes with matching A6 envelope that is 100% recycled. 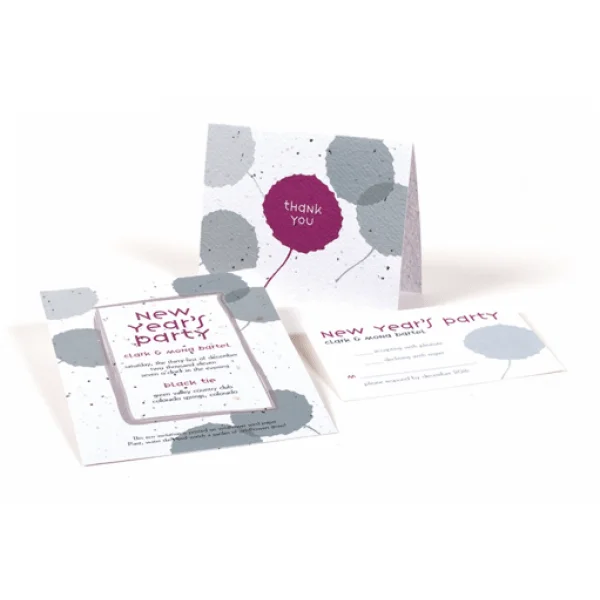 Premium Seed Paper Invitations from Custom Earth Promos are a planet friendly way to promote any and all special events on an eco-friendly medium that benefits brand image and value. Sure to impress eco-conscious customers and guaranteed to grow in any US Climate Zone, your seed paper invitations will soon become flourishing wildflower gardens that represent the ongoing eco-friendly initiatives of your brands. Keep your customers informed of new green initiatives and sustainability strategies with eco-friendly seed paper announcements. A potential green initiative all its own, make an admirable impression on guests with a company-wide promise to eliminate eco-impact by only using paper invitations that are 100% natural and pose no threat to the environment. With eco-elegance and the ability to be customized in a wide array of design and format options, seed paper invitations are entirely adaptable to meet high-end promotional goals for brands of virtually any industry. Custom Earth Promos' Premium Seed Paper Invitations support the eco-optimized marketing efforts of customers serving the healthcare, hospitality, travel, leisure and beauty industries. To remain competitive, it is vital for brands in every sector to establish an eco-friendly brand image. The increasingly eco-conscious consumers of today have rapidly evolved in standards for sustainability. Modern day consumers expect a proactive approach to planetary preservation from the brands they give their business to, placing unprecedented brand value in social and environment-centric ethics. 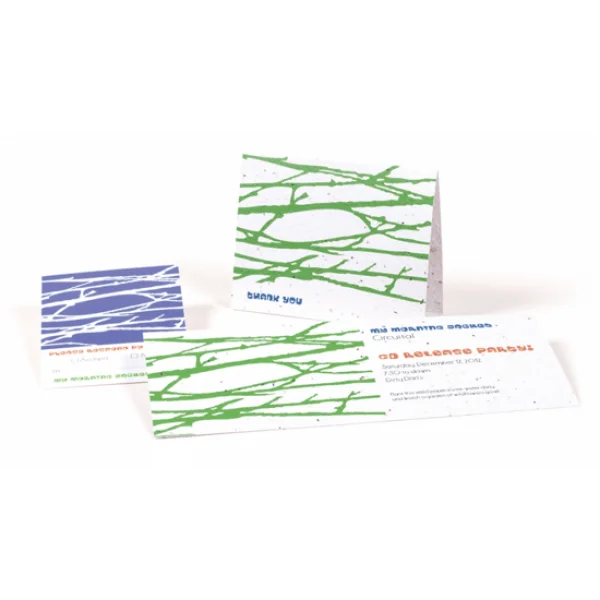 Seed paper invitations are a great way to promote green events and invest in an eco-friendly brand image. The entire invitation is ready-to-plant, blooming into a lasting reminder of your business's eco-aware initiatives. Custom Earth Promos' Premium Seed Paper Invitations are 100% recycled and available in a variety of colors and designs, making them a valuable green promoter for any brand event or announcement. With product construction that offers an immediate contribution to the ecosystem and an elegant presentation, our seed paper invitations will help to increase the value of your brand image and eco-friendly association. Work directly with one of our in-house design experts to bring a specific campaign vision to life. We'll review all aspects of the design with you to ensure your message is brilliantly captured and boldly rendered on our premium quality seed paper, with aesthetics that reflect your brand in exquisite detail. We'll review potential personalization options with you, including card style, printing processes, and techniques. Ask your Custom Earth Promos design expert about CMYK full-bleed, a popular printing process which renders graphics that stretch beyond the edge of trim and letterpress printing, a technique that achieves a traditional, embossed invitation style. Together, you will build an order blueprint of the optimal methods to reflect your brand. 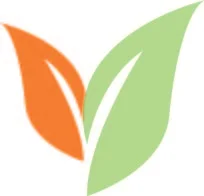 We can even personalize your order with a specialty or seasonal vegetable, herb, grass or flower seed mix. Our creative team reveals exciting custom seed mixtures all year round. Be sure to ask what specialty seed mixes are available!